A Three-Pound Monkey Brain: What is a human? Find the human! Pretty easy, right? RIGHT?? It is obvious what is "human" and what is not if we just look at living organisms. There's a clear gap between us and our closest living relatives, the chimpanzees. No danger of mistaking one for the other. But this clarity vanishes as soon as we look at the fossil record. There's a gradient of forms between us and things that are not clearly closer to us or chimpanzees (Ardipithecus, Orrorin, Sahelanthropus). Which ones are "human" and which are not? Is Praeanthropus afarensis human? What about Homo habilis? Homo ergaster? Neandertals? Homo sapiens idaltu? Find the human! Or is there more than one? Or are they all human? This issue crops up for all kinds of taxa. Much time has been spent arguing what is and is not e.g., avian, or mammalian. The issue is more common within vertebrates than many other taxa, since vertebrates have an especially good and well-studied fossil record. But it applies, in theory or practice, to every extant taxon. I subscribe to the school of thought that names born from neontology (the study of extant organisms) are best restricted to the crown group (that is, to the living forms, their final common ancestor, and all descendants of that ancestor). Arguments for restricting common names to crown groups were first laid out by de Queiroz and Gauthier (1992). The primary reason for doing this is that it prevents unjustified inferences about stem groups (that is, the extinct taxa which are not part of the crown group, but are closer to it than to anything else extant). For example, we currently have no way of knowing whether the statement, "Within all mammalian species, mothers produce milk," is true if we include things like Docodon as mammals (or, as a few have done, even earlier things like Dimetrodon). However, if we restrict Mammalia to the last common ancestor of monotremes and therians (marsupials and placentals) and all descendants of that ancestor, then the statement unambiguously holds. This is a nice, neat system. However, for humans, it gets a little sloppy the closer we get to the crown group. For a long time, there was a debate in paleoanthropology as to how our species originated. We are distributed across the globe, so it's not immediately obvious where we are from. As the hominin fossil record gradually came to light during the 20th century, it became clearer that the earliest roots of the human total group were in Africa, since that's where the oldest remains are found. Everything before two million years ago is African, and only after that time period do we start to see remains in Eurasia, all of them belonging to the genus Homo. Remains in Australia and America don't occur until very late, and only modern humans appear in those regions. But this leaves open the question of our own species' origin. Homo had spread all over the Old World by the time modern humans appeared, so we could have come from anywhere in Africa or Eurasia. Two major hypotheses were formed. The Out of Africa Hypothesis suggested that the ancestors of humans originated in Africa and then spread out over the globe, displacing all other populations of Homo: the Neandertals in West Eurasia, Peking Man in Asia, Java Man in Malaya, etc. The Multiregional Hypothesis, on the other hand, suggested that modern human races evolved more or less in their current areas: Negroids were descended from Rhodesian Man, Caucasoids from Neandertal Man, and Mongoloids from Peking Man. These hypotheses competed with each other until the advent of genetic analysis. When scientists were finally able to study the mitochondrial genome, which is copied from mother to child, they found that all living humans shared a relatively recent matrilineal ancestor, much more recent than the splits between Rhodesian, Neandertal, and Peking fossils. Furthermore, the matrilineal family tree strongly points to an ancestor in Africa, where the most divergence is found. Study of the Y chromosome, which is copied from father to son, indicated an even more recent patrilineal ancestor, also African. The case seemed closed. Out of Africa had won. The case seemed further bolstered when the Neandertal mitochondrial genome was recovered. It revealed a signature which clearly placed it outside the modern human group (Teschler-Nicola & al. 2006). Earlier this year, mitochondrial DNA was also retrieved from an indeterminate fossil from Denisova, Siberia, indicating that it represented a matrilineage even further out, preceding the human-Neandertal split (Krause & al. 2010). This would give us a pretty nice, clean series of splits. And it would mean that Neandertals, Denisovans, etc. are stem-humans. But there is more to ancestry than just the matrilineage and the patrilineage. Most of our ancestral lineages include members of both sexes (think of your mother's father and your father's mother). The matrilineage and patrilineage are the only ones that can be studied with clarity, since all other chromosomes undergo a shuffling process. But those other lineages exist nonetheless. Only very recently has evidence come to light which challenges Out of Africa, at least in its strong form. Earlier this year, a study suggested that all humans except for Sub-Saharan Africans have inherited 1–4% of their DNA from Neandertal ancestors (Green & al. 2010). And just yesterday, a new analysis of Denisovan nuclear DNA showed that Melanesians have inherited 4–6% of their DNA from Denisovans. This nuclear DNA seems to originate from an ancestor close to the human-Neandertal split, but somewhat on the Neandertal side. Long story short, the picture has gotten a lot more complicated. It's no longer, "Out of Africa, yes, Multiregional, no." Now it's, "Out of Africa, mostly; Multiregional, somewhat." So what does this mean for the term "human"? Are Neandertals and Denisovans human? After all, they seem to be ancestral to some, but not all, modern human populations. Still, at this level of resolution, we start to see a problem with the crown clade usage. What is the final common ancestor? Many would assume it to be the last-occurring common ancestor, but this is problematic, and not just because that ancestor probably lived within recorded history (making, e.g., the Sumerians inhuman!). When I say "final" I'm really referring to something a bit more complex—the maximal members of a predecessor union. (More discussion here.) But determining what that is, exactly, requires better datasets than we have. I still think it's a good convention, and if its application is a bit vague, so be it—our knowledge is a bit vague. For now I would say that humans are a clade of large, gracile hominins with high-vaulted crania that emerged roughly 150,000 years ago in Africa, and then spread out. They are descended from not one but at least three major populations of stem-human. One of these, the African population (idaltu, helmei, etc. ), forms the majority of the ancestry, up to 100% in some populations. The others, Neandertals and Denisovans, only form a small part of the ancestry of some humans. I feel this convention is useful because it prevent unjustified inferences. For example, we know that all living human populations have languages with highly complex grammar. We really don't know whether Neandertals and Denisovans had such languages, or whether the immediate African predecessors of humans did, for that matter. So it's good to be able to categorize them as stem-humans, because it reminds us that we don't have as much data available on them as we do for the crown group. We have to be more clever in figuring these things out. And if we ever cloned a Neandertal? Well, ask me again once that happens. It seems like this is just a "failing" of phylogenetic nomenclature as traditionally used at very high resolutions. Terms like 'last common ancestor' work well at low resolutions, but in reality, evolution is often more of a net than a tree. It also looks like another illustration that "species" are fuzzy concepts. If the "last common ancestor" is treated as a species, the definition falls apart at high resolutions. It seems that the biggest problem with humans is that the crown clade defines a specific set of populations which may overlap with other, non-included populations, so that if _Homo_ (or even _Homo sapiens_ is defined this way, it doesn't correspond to a "species" under many species concepts. I can see how that would throw people off... Is there a better way for phylogenies to deal with complex chronspecies? Phylogenetic nomenclature certainly does depend on the resolution. Some people are saying that, since interbreeding with "archaics" like Neandertals and Denisovans is turning out to be not uncommon, we ought to go back to including those in Homo sapiens, as other subspecies. In that case, if you were using species as your unit, they would be human. Or, if you used smaller units, like individuals, then the crown group would be a clade within Homo sapiens. I think that you simply need to be very aware of the resolution you're using. I also think we shouldn't be horrified at the idea that a species might overlap a clade. And, finally, I think that we've placed far too much importance on the word "species". and what of the consciousness inhabiting these various bodies? they are, after all, just vehicles. Consciousness is a property of the biological system, not a substance that is separable from it. It's basically a self-monitoring system. Read some Damásio. 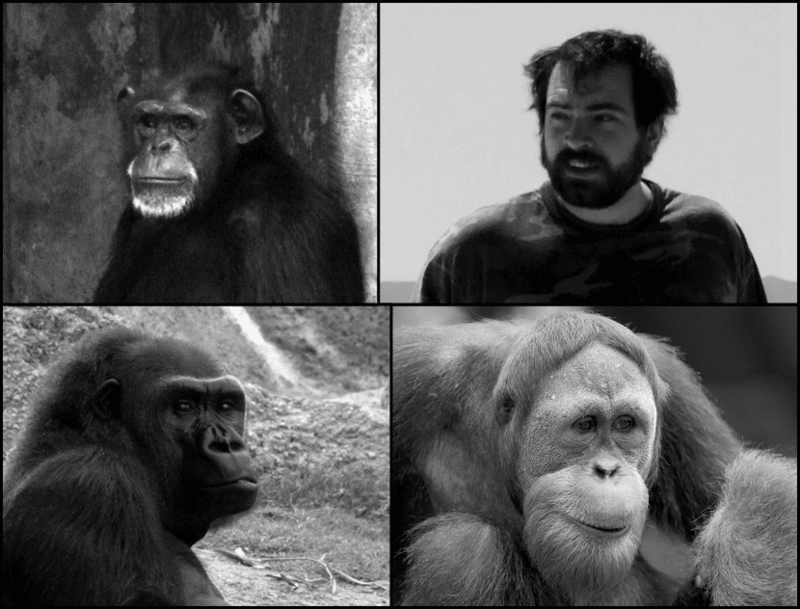 Quite a few of our extant outgroups are conscious (chimpanzees, gorillas, ... [list truncated] ... various bilaterians), so it's pretty likely that stem-humans were as well. Of course this depends on your definition of "conscious". I only experience my own consciousness, so unless we're allowing for some form of induction I can't speak beyond that. To the first comment, I'd also like to point out that phylogenetic nomenclature is fully capable of dealing with networks, not just simple trees. But it is very true that resolution is important, as well as determining what constitutes ancestry. Basically, PN only works after you've selected your units/vertices and your relations/arcs. Would defining "human" in terms of the crown group mean that the definition of "human" would become increasingly more restrictive through time? Could individuals presently considered human (either living or dead) become "dehumanized" once the crown group shrunk to exclude them? Or would we have to pin the definition to a crown group as it existed at a particular time? Neil, that is an excellent question. You are absolutely correct that this could possibly lead to a shifting definition of "human" over future millennia. When defining formal terms, the PhyloCode will allow people to clarify what they meant by "extant", or, if they do not, it will be interpreted as "extant on the publication date of the definition". With informal terms like "human", there are no such dates. I would go and call our species modern/common human, and make human a broader concept (the clade Homo, for example). After all, the divergence between us and Neanderthals is roughly the same as the one of the different species in the other extant 3 genera of hominids (as far as I know), and I wouldn't call a pigmy chimpanzee a "stem-chimpanzee" if it gets extinct in my remaining years. And I know I didn't use bonobo. The reason behind that brings me to my other point: Names are powerful. Nobody seems to remember the Eastern gorilla and the Sumatran orangutan (well, at least they get more recognition that when they were subspecies, that's another issue), saying that there are 4 great apes (ignoring us, God forbid somebody imply that the perfect human has something to do with filthy apes, as all the common biological and behavourial characters, as well as the extensive fossil record, mean nothing, as most humans are anthropocentric for obvious reasons). However, Pan paniscus made it when it got renamed from pigmy chimpanzee into bonobo. And most people think of it as a separate entity from P. troglodytes, with the same relation with it that with gorillas. Names are powerful. If you say Neanderthals are not human, people stop thinking of them as persons, and more like your average wild animal. Displays of culture, speech, interbreeding... It'd mean nothing, for most people, implying that Homo neanderthalensis is not human would leave the species without any "personhood", you may say. Well, this is my opinion, rereading it feels a bit pedantic, sorry about that. I have the same pet peeve about great ape names. I prefer to think of them as "bonobo chimpanzees" vs. "common chimpanzees". To that point, if Pan paniscus went extinct, they could be seen as "stem-common chimpanzees", but they would still be (er, have been) chimpanzees. What if we considered Neandertals people but not humans? I also have no problem with terms like "near-humans". My problem with stretching "human" back to include all of Homo is that it draws a completely arbitrary line. Why not push it back to include some or all "australopithecines"? Or why not restrict it to just include H. ergaster and its descendants (which I personally find a much more significant clade)? The divergence between humans and Neandertals is actually much, much less than between the species of Pan. In chronological terms at least, it's more like the divergence between us and "Lucy" (actually more--the divergence between us and A. afarensis's [other] living descendants, if it had any). 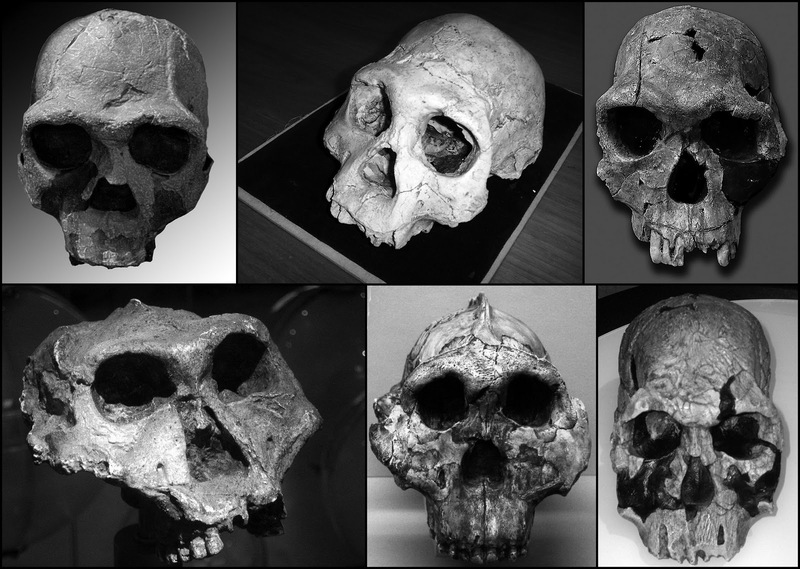 Even the subspecies of P. troglodytes diverged only around the same time as H. ergaster. But, really, this is beside the point. It's not about divergence times. It's definitely not about trying to make terms like "human" and "chimpanzee" into some sort of equivalent (we've already seen how untenable this approach is many, many times over). It's about limiting unjustified inferences. Hi, great post, very interesting, clear and well explained. Do you think that the genus Homo is formed by discrete species or is a developmental continuum of the same species? Thank you very much and congratulations for your blog. I don't know the answer to that. Unfortunately the genesis of Homo took place during a time that is not well-represented in the fossil record. (It's not completely barren, but it's not as good as the adjacent times.) There is debate as to whether the earliest well-known Homo form one species (H. habilis) or two (H. rudolfensis additionally) or even three (H. gautengensis as well). There is debate as to which non-Homo stem-humans are closest to Homo (leading candidates being Australopithecus sediba [too late to be an ancestor, but possibly morphologically similar to the ancestor], Australopithecus garhi, Australopithecus africanus, Paranthropus [as a derived sister group, not an ancestor candidate], Kenyanthropus platyops, or Praeanthropus afarensis). Maybe Homo had one ancestral population, and maybe it had several. We need more finds to help clarify this. See also my related post: Hybridizing Stem-Humans: Or, Is Everyone Right?